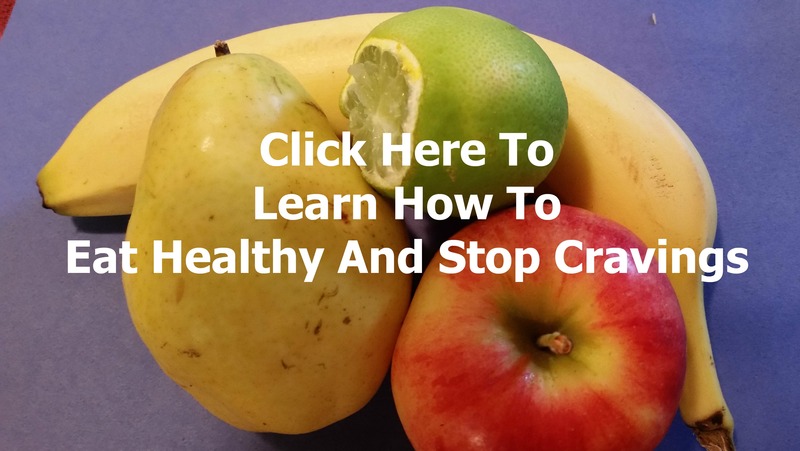 Many people have a hard time overcoming their sugar cravings. 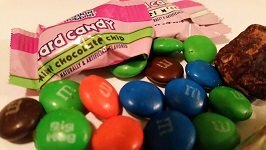 I remember being a young child when my dad would watch me continually eat candy and other sweet junk food. He would say "You eat so much sugar, you are probably going to get diabetes!" I told my friends mom what my dad said, fearing he was right. She tried to ease my fears by saying "Diabetes is hereditary, not just from the way you eat." They were both right. Too much glucose (sugar) in the blood on a continual basis can cause insulin resistance, which will start to keep blood glucose levels high. This is how many people get type 2 diabetes, and why changing to a low sugar diet can reverse this type of diabetes. On the other hand, other people can handle more sugar in their system without noticeable adverse effects. (I said 'noticeable' because too much sugar in the body can cause harm that isn't so apparent). Research shows the same pleasure centers are stimulated in the brain when a person consumes sugar, as is stimulated when a person is addicted to drugs. Sugar in the body sends the hormone tryptophan to the brain to release serotonin, a 'feel-good' hormone. Glucose also causes dopamine, another 'feel-good' hormone to be secreted from the brain. One former drug addict attests that sugar addiction is "exactly the same as addition to abusive drugs." Also, as in drug addiction, the more sugar you ingest, the more your body wants because your body builds up a resistance to it. Some nutrition experts believe sugar should be labeled and regulated like a drug by the FDA. Dr. Joseph Mercola says sugar is "one of the most dangerous substances that you can ingest." Food manufactures know the effect sugar, glucose and fructose in particular, have on peoples physiology and they contribute to our sugar cravings by adding it to foods in many forms, especially in the form of High fructose corn syrup. This just adds to the problem. You may think you are avoiding sugar, but when you eat almost any processed food, you are ingesting more of the sweet stuff than you realize. Lets consider these numbers and what they mean. If Dr Mercola is correct, then since the 18th century, we are consuming around 2000 times more sugar (in various forms)! Though the numbers vary slightly, since 1970 people in America on average consume 1/4 lb of sugars a day. That comes out to 89 lbs a year, compared to just 4 lbs a year three centuries ago. That is quite an increase in sugar cravings of the average American. Also a fact to notice from this chart is that 1970 had the highest consumption of sugar in sucrose (table) form at 17.7 teaspoons a day and very little high fructose corn syrup at .01 teaspoons daily. From 1972 through 1999 on the full chart from the USDA, you see a gradual increase each year of HFCS consumption (and lower table sugar consumption). It was at that time food companies found it was more economical to sweeten food, especially soda pop, with HFCS than with regular sucrose. 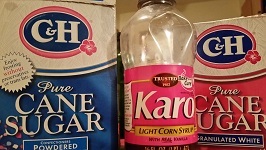 While high fructose corn syrup is very similar to sucrose, it has 5% more fructose than sucrose. sucrose is 50% fructose and 50% glucose, HFCS is 55% fructose and 45% glucose. There are important difference between glucose and fructose. Fructose is a form of sugar found in fruits, root vegetables and honey naturally. Consumption of fructose should ONLY be through eating the whole foods that contain it. The reason is, fructose goes directly to the liver where it can be digested. When the liver has an overload of fructose, the excess fructose molecules get converted into fat, which studies show raise triglyceride levels in the body and LDL, cholesterol carriers that often cause cardiovascular damage. Some of it can be converted to uric acid which also causes cardiovascular problems, gout and other health issues. Glucose, unlike fructose is used for energy by all the cells in the body (and in all life forms). Without it the cells will die. It goes directly into the bloodstream to the cells with the help of insulin. only 20% goes to the liver for digestion, and all but 2 % of that gets stored as glycogen for later energy use. So is sucrose a better choice for someone with sugar cravings than high fructose corn syrup? 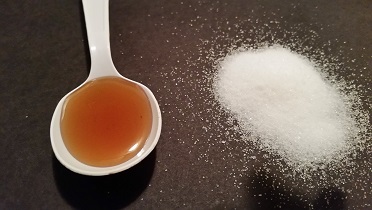 The truth is, refined sugar in any form, syrup, crystal or powder should be avoided. But if you had to choose between HFCS or table sugar (sucrose), for the reasons cited above, sucrose is the lesser of the two evils. Not only does it have a little less fructose, the chemical make-up has both the fructose and sucrose bonded together, requiring an enzyme in the digestive system to separate them, leaving a little more time before the fructose gets to the liver. The chemical bond is not there in the HFCS, sending fructose to the liver immediately, putting more stress on the liver. Also High fructose corn syrup is processed using mercury and lye, two highly toxic substances to the body. Traces of mercury have been found in foods with HFCS. "Functional medicine" expert Dr Mark Hyman details the problems with HFCS in this article . I know from personal experience, what the struggle to overcome sugar cravings entails. At age 45 my body could feel the ill effects of too much sugar, but I still craved it. A local nutritionist had a radio program I listened too often on Sunday mornings driving to church. One of his pitch lines was "Conquer Your sugar Cravings!" I called his office for an appointment and over a four month period, he coached me in how to change my diet to not just loose the craving, but to acquire a distaste for sugar to the point that just talking about, rich, sweet deserts now makes my stomach turn. One of the first things he asked me in the consultation was "Can you give up sugar? If you can't, I can not help you." I told him I thought I was ready to give it up. When he tested me, the only grain he found I should eat was brown rice. I could eat all the blueberries and strawberries I wanted, but limit other fruits. These were the sources of carbohydrates I was allowed to eat on his plan, as well as vegetables which have carbs too. I wasn't to eat any processed food with added sugar. It took discipline but I stayed away from the refined sugar and when I had a sugar craving, which happened often, I ate either a handful of berries or a bowl of rice. The bowl of rice took a little longer to get into my blood, but I found after about 10 minutes it would quench my symptoms. using this method I was successful. 1. Keep plenty of fruit and whole-grain carbs around without added sugar. As I said above, this is what I did and when I felt the urge for something sweet, I ate the food with 'natural' sugar instead. You may not be limited to brown rice, oatmeal is a very good whole-wheat carb to keep you satisfied because it is digested quite slowly. Apples and pears and watermelon are also good foods to eat when sugar cravings come on. Sometimes the craving for sugar isn't because it wants something sweet, a lot of that sweet junk food has certain nutrients your body needs, and often sugar depletes these nutrients including, magnesium, chromium, phosphorus and tryptophan. 3. Eat healthy protein at every meal. Protein is broken down into glucose in the digestive system, but at a much slower rate than carbohydrates, therefore it helps stabilize blood sugar. 4. Eat a healthy snack including protein and complex carbohydrates between meals. Have a piece of fruit and some cheese or nuts, or cottage cheese and whole wheat triscuits between meals. This will help maintain blood sugar levels. Low blood glucose level is a cause of sugar cravings. If you have an overload of bad bacteria in you digestive system, it will increase sugar cravings because they feed on sugar. A pro-biotic like unsweetened yogurt or keifer will populate your gut with more good bacteria and less bad bacteria. Many people believe sugar substitutes in their favorite foods will satisfy their sugar cravings but studies show those who use alternative sweeteners actually could have an increased desire for sweet foods. Artificial sweeteners have also be shown to have toxic effects on the brain and digestive system.